I know I've said it before, but I really enjoy reading book geared toward young readers, perhaps because I'm a mom of two kids in the 8-12 age group, but maybe more so because books were everything to me as a kid. I am always hopeful that I can find a book and give it to the right child and that's the one that starts a life long passion of reading. Based on the author's childhood in the 1960s, a young Cuban-Jewish immigrant girl is adjusting to her new life in New York City when her American dream is suddenly derailed. Ruthie Mizrahi and her family recently emigrated from Castro's Cuba to New York City. Just when she's finally beginning to gain confidence in her mastery of English and enjoying her reign as her neighborhood's hopscotch queen, a horrific car accident leaves her in a body cast and confined her to her bed for a long recovery. As Ruthie's world shrinks because of her inability to move, her powers of observation and her heart grow larger. She comes to understand how fragile life is, how vulnerable we all are as human beings, and how friends, neighbors, and the power of the arts can sweeten even the worst of times. Easily the best thing about the book is the writing, it's written in the voice of a young Ruth and it reads as if a child her age actually is writing it. The book starts off with acquainting you with Ruthie and her family, a Jewish family having just immigrated from Cuba in the 1960's. Her mother is having a difficult time adjusting to life in America and relies on Ruth to translate English to Spanish for her. Ruth also has her own issues, at first being relegated to the "dumb class" she works so hard to get transferred to the "smart class". Finally, finally just as things are looking up for her, Ruth and her family are involved in a horrific car accident that leaves her in a body cast. 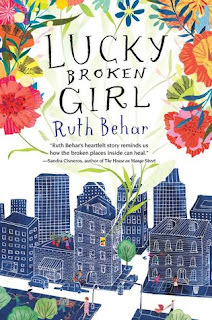 Her mother begins to resent her because she becomes Ruth's primary care provider since they cannot afford a home nurse, and Ruth struggles with depression and anxiety. It's an absolutely tragic story with a beautiful outcome that gently teaches children about tragedy, the vulnerability of life, persistence, and grief. It also highlights the cultural differences in America and what the challenges immigrant children face. I also loved the sheer optimism of Ruth's family about the opportunities America holds for them. You can do anything, it's America! It's something so many of naturally born citizens take completely for granted, and I really appreciate this author showcasing that. If you have a kiddo in grades 2-5 who enjoy reading, or perhaps they are an immigrant themselves, I highly recommend this book. It's a great selection to have as a classroom read and ask students what they think about Ruth's story, between her difficulties in school, her injury, and her fears as she recovers. Jackson is 9. Watch out, ladies. Life is cruel and optimism is pointless.